At Everything’s Connected we love food. Real food. What do we class as real food? Nutrient dense and minimally processed, something your grandma might have cooked up for you, not something your likely to get out of a glass window as you drive away. Even better if that something has been grown in your backyard! 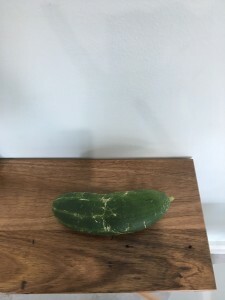 I’d like to give a big shout out of thanks to Fannicia Phelan who kindly gifted her osteopath with this lovely homegrown cucumber. Can’t wait to rock this in my salad today! Everything’s Connected Osteopathy is your premier osteopathic clinic located in Camberwell Melbourne on Riversdale Road. Everything’s Connected Osteopathy are osteopaths who use movement to assess and treat musculoskeletal disorders. At Everything’s Connected all osteopaths have nutrition qualifications and are focused on an active treatment and management plan. Our clinic sees patients of all ages, ranging from children to the elderly. Common conditions typically presenting to the clinic include sports injuries, osteoarthritic related aches and pains, neck pain, back pain, weight loss and upper and lower limb injuries. To find out more about us at Everything’s Connected Osteopathy, click on the link here. Everything’s Connected Osteopathy is located at 734 Riversdale Road, Camberwell. We are a short 5-minute drive from Camberwell Junction and a 2-minute walk from Riversdale Road Train Station. Appointments can be made by calling us on 03 98886176 or emailing reception@everythingsconnected.com.au.